What does the Single Use Carryout Bag Ordinance do? Why was an ordinance adopted? When did the ordinance take effect? Why not include all stores in the city? Can customers bring their own plastic, paper and/or reusable bags? What if customers don’t want to buy/bring a reusable bag or purchase a paper bag? Are all bags provided by stores subject to a charge? Does everyone have to pay the bag charge? Is the charge per bag taxable? Who keeps the (minimum) 10 cents per bag? Can stores charge more than 10 cents per compliant bag? Why is there a charge for paper bags? Can non-affected stores sell bags to customers? Where can I purchase recycled content paper bags for my store? Are bioplastic bags allowed as reusable bags? How should reusable bags be cared for? Are reusable bags a health hazard? Have similar ordinances been successful elsewhere? How will the Single Use Carryout Bag Ordinance be enforced? Below is a map provided by the Chico Enterprise-Record showing which stores are a part of the plastic bag ban. The Single Use Carryout Bag Ordinance prohibits single-use carryout bags at certain retail stores in the City of Chico. Starting January 1, 2015, reusable bags or bags made of recycled content paper may be provided, but only if the store charges a minimum price of 10 cents per bag. The ordinance does not prohibit bags used to protect and transport produce, bulk food or meat from within a store to the checkout or cash register. Other retailer, restaurants and take-out food establishments are not affect by the ordiance. The Single Use Carryout Bag Ordinance was adopted by the City of Chico to decrease the number of bags going to landfill, reduce litter in our local waterways, and save the city and county money on litter and storm drain cleanup. Cleaning up litter and storm drain trash is costing cities millions of dollars each year. This ordinance will help to reduce those costs since plastic bags are currently one of the most prominent items found in storm drains and in coastal cleanups. January 1, 2015 for large grocery stores, pharmacies, and other retailers that carry a full line of groceries. The ordinance bans single-use plastic bags in large grocery stores, pharmacies, and other retailers that carry a full line of groceries. It will take effect January 1, 2015. Convenience stores and smaller grocery stores have until 2016 to comply. The ordinance includes the stores that traditionally distribute a high volume of single-use bags. Yes. Consumers may bring any type of bag (including single-use plastic bags) to a store for their purchases, and are encouraged to do so. Customers are only charged for bags provided by the store at check-out. Customers can carry their paid purchases out by hand, or put their goods back into a shopping cart or basket to transport to their vehicle to unload. No. The ordinance does not regulate use of single-use bags used to protect and transport produce, bulk food or meat from within a store to the checkout or cash register. Other bags not subject to charge include bags provided for carry-out of hot/prepared foods for consumption at or away from the store, bags without handles provided to the customer to hold prescription medication dispensed from the pharmacy and bags without handles used to segregate food that could damage or contaminate other contents of a carry-out bag. A protective bag can also be put on an item at check-out to ensure the safety of the item (ex. wine bottle sleeve) or change out the packaging for reuse (ex. berries from the baskets to paper bags). No. 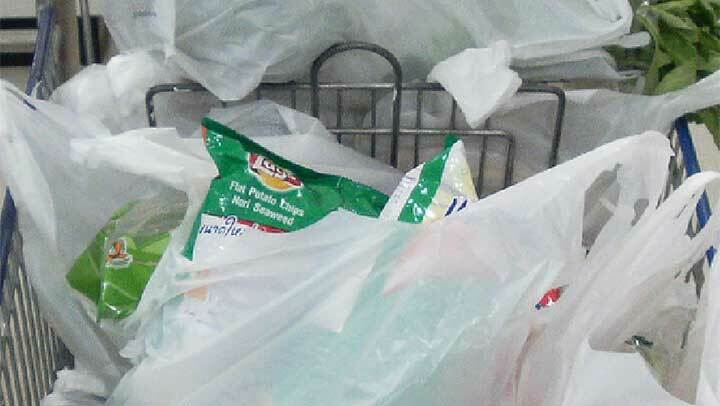 The ordinance does not regulate use of single-use bags used to protect and transport produce, bulk food or meat from within a store to the checkout or cash register. Other bags not subject to charge include bags provided for carry-out of hot/prepared foods for consumption at or away from the store, bags without handles provided to the customer to hold prescription medication dispensed from the pharmacy and bags without handles used to segregate food that could damage or contaminate other contents of a carry-out bag. A protective bag can also be put on an item at check-out to ensure the safety of the item (ex. wine bottle sleeve) or change out the packaging for reuse (ex. berries from the baskets to paper bags)..
No, the State Board of Equalization (BOE) indicates that the charge on bags would not be subject to State sales tax. Please see this statement from the BOE. All proceeds from the sale of recycled paper bags and reusable bags are retained by the retailer with no restrictions on their use. The manufacture of single use paper bags requires energy and has environmental impacts. Charging for paper bags and restricting the use of plastic bags encourages reusable bag use. A non-affected store may sell bags to customers but is not required to do so. If a store is not affected and wishes to sell bags at check-out, please inform customers that the sale of bags at checkout is a company decision and not a requirement of the Single Use Carryout Bag Ordinance. Stores uncertain about their status under the Single Use Carryout Bag Ordinance should contact us at bags@stopwaste.org. Talk to your distributor about sourcing bags that meet the specifications. For more information, please see bag specifications and Recycled paper bag suppliers & testing resources (PDF prepared by the City of San Jose, Department of the Environment). No. They do not meet the specifications of a reusable bag. It is a good idea to regularly clean reusable bags. Most fabric bags can be washed in the washing machine. Other recommendations include: air out bags so moisture evaporates; and designate specific bags for meats and fish. Please see "Practical Tips for the Use and Care of Reusable Grocery Shopping Bags" from the California Department of Public Health. Studies from multiple sources, including Consumers Union (publisher of Consumer Reports), have shown less bacteria on reusable bags than on most household surfaces regularly used for food preparation. Yes, other Single Use Carryout Bag Ordinances other places including Los Angeles County and San Jose have been very effective in reducing the quantities of single use bags being distributed and becoming litter. The City of Chico will enforce the ordinance in consultation with city staff where the store resides. We expect stores to voluntarily comply and will provide assistance to help stores make the transition as easy as possible. Warnings and enforcement actions will be taken as needed. If you have questions about the ordinance, contact Linda Herman at call 530-896-7241 or linda.herman@chicoca.gov. You can download the ordinance here.